Salon Success Academy’s very own Juan Rodriguez won first place in this year’s Barristar Barber Battle in October. Juan found out about the barber battle at Salon Success Academy and immediately signed up. However, the road to first place was not an easy one. His model cancelled just days before the competition. So, he had to scramble and eventually found someone with the long, thick, and coarse hair he needed for his vision. The timed competition gave him one hour to create his flat top style. Juan knew that he had to be conscious of the time and shake off any nerves. He created a super flat top, about 5 inches from the forehead up. The design he created on the sides wasn’t exactly what he originally planned, but he made the best of it. At the five minute mark, Juan realized he had paced himself well, so he shaped the sides, used shears to work on the top, detailed the sides, reshaped one last time, triple checked the lineup, brushed off, and added some oil. The competition was stiff, but his hard work paid off with a win in the end. Juan’s success comes from the passion he has for his craft. Juan has been cutting hair since he was 17 years old. When he graduated high school, he asked his own barber if there were any opportunities for him. He is thankful for the mentorship that developed soon after. But he realized he needed to earn his license if he wanted to make barbering his career. It wouldn’t be easy. Enrolling in school would mean juggling his time between work, school, and family. That all changed when he went to Salon Success Academy for a tour. He realized the convenient location and support the staff and students provided would make it all possible for him. 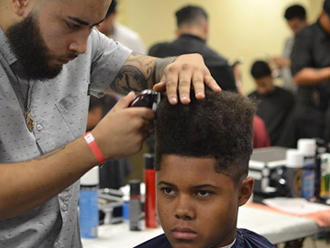 For Juan, barbering is much more than a career. He says is makes him “feel alive.” If barbering sounds like the right career for you, you too can follow your dreams. Find out how by calling 877-987-4247 today. To learn more about Barristar Student Services and upcoming events, check out what’s going on in your area.